Valentine's Day is all about love — whether you're sharing it with a significant other or celebrating your family and friends. What better way to get into the holiday spirit than with some fun nail art? We've rounded up the 10 best Valentine's Day-inspired manicures that will get you feeling the love. 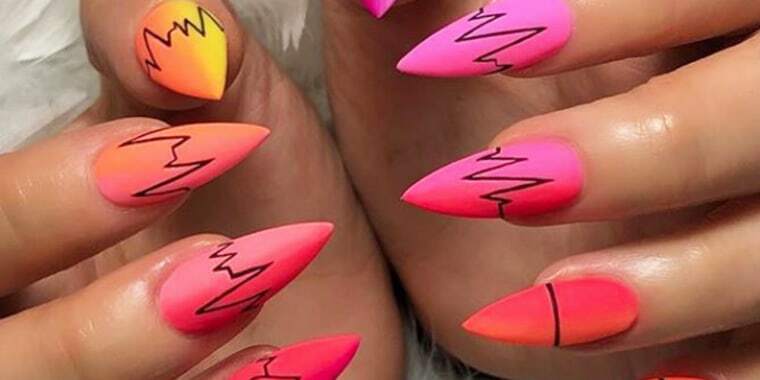 Scroll down and get ready to wear your heart on your nails. The mix of purples, red, and pinks against a bright white base makes for a really fun and pretty nail look. Your heart is nothing without a heartbeat. Put against different neon colors, this nail look is one of our favorites for this holiday. If you can't say, you can wear how you feel on your nails. Write fun little messages to express how really feel. Valentine's Day isn't all about hearts. Dress your nails with pretty flower decals to switch it up. These heart shapes are just fun and we love the foil details for a really elevated look. Love can be a game sometimes, but in the end it is totally worth it. An ode to a love that rarely disappoints, dedicate your love to your favorite foods with a fun food art like the ones pictured above. We love a good lip decal and this artsy one is the perfect nail art to celebrate Valentine's Day. You can't go wrong with a classic red mani. Make it extra by adding some glitter to make your nails really sparkle. If you really want to stand out, go all out with bright neon pink with a purple tip. You'll stop people in their tracks — guaranteed.